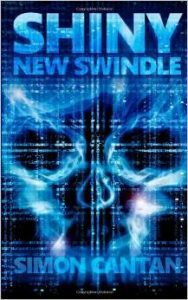 Shiny New Swindle features an advanced technological world where all a person needs to connect to the web is a tiny brain implant. As a result hackers are “king or queen”. One of the most successful groups include Chris, Max, Hailey, and Erika. Each member has perfected a code program that hacks into people’s implants. Chris’s program makes him invisible; Erika’s hack makes people susceptible to suggestion; Hailey’s code puts people to sleep; and Max’s program knocks people out cold. Combined the hacks allow them to steal millions of kronor from a bank. The group expects the heist to dominate the Internet. Instead almost instantly their achievement disappears replaced by news of government officials dying at the hands of their security detail under the control of an advanced hacking program. Unbeknownst to the group the next server they hack into is an elaborate trap. Before they know it they are the prime murder suspects in the murders with their digital images everywhere. The group goes deep underground, using technology only to cover their trail, so they can evade the police. While on the run they strive to figure out who is framing them and why. 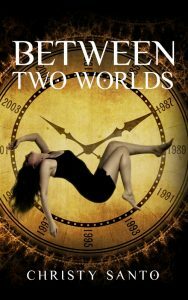 Simon Cantan has written an exciting futuristic novel. I would highly recommend it to others to read – it won’t disappoint!